As part of our ongoing efforts of providing more exposure to startups coming out of Australia and help them today were are going to showcase Clickfind™. Founded by Carolyn King and Taco Fleur, Clickfind™, is an online business directory that charges a monthly fee to businesses who list their products and services. Established for the Australian marketplace, its intellectual property is owned by clickfind Pty Ltd which means the clickfind™ technology and brand can also be licensed to international markets. The idea of clickfind came about when we wanted to list our own businesses in business directories, one of them being the Yellow Pages. We had an experience that left a bad taste in our mouth, an empty wallet and no results. Thats when we decided to create a business directory/search engine for Australia that is different and excels in the areas others don't. • How long it took to get up and running? The business was set up in mid 2007. Business scoping, brand design and web development took approximately six months and clickfind™ was launched as a fully functional website in December 2007. It is Australian owned, run and managed by an experienced, enthusiastic team based in Brisbane. 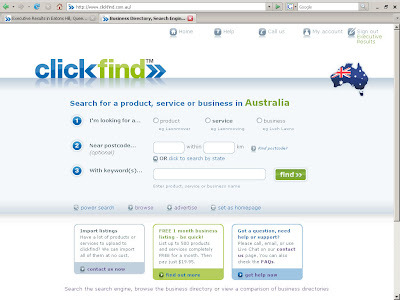 Clickfind’s aim is to become the best business search engine in Australia and become the definitive source for all of Australia’s over 2 million registered businesses. • What is unique about clickfind? Comprehensive listings: Unlike other directories or search engines, clickfind™ allows a business to add individual listings for each of their products and services (up to 500 of them), as well as basic business info. This allows a business to create a complete online product catalogue which can be shared and syndicated in several ways. A clickfind listing can also act as a mini-website for small or start-up businesses, and a business can have its own unique URL. SEO performance: As well as being a self-contained directory, clickfind™ has been built to optimize performance in external search engines (such as Google) and drive traffic to clickfind™ customers’ websites. Other directories don’t utilise search engine optimization (SEO) techniques in this valuable way. No advertising: clickfind™ does not display any paid advertising (banners). Other sites often display ads of competitors next to business listings, reducing the effectiveness of the listing. They also offer premium listings, which means the most relevant results are often not shown first. 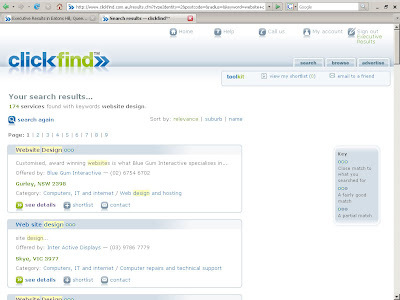 Instead, clickfind™ focuses on making the users’ search as useful and relevant as possible. Genuine Aussie businesses: only businesses with a valid ABN are listed on clickfind. This means users will know they’re dealing with a local business (unlike those often found via search engines). Additional unique services: clickfind™ includes a number of additional features not found in other directories, including a wiki-like article sharing feature, free email service, postcode finder, and maps with driving directions. These features are either already available or under development, and other features are in the pipeline. The aim of these services is to increase clickfind’s overall value and usefulness, driving more traffic and thus more revenue. • What is your target market? Another target market is people involved in internet marketing. This can include SEO experts, web designers, copywriters, bloggers and marketing professionals. These people are in a position to influence business owners and recommend clickfind listings as part of a cohesive marketing strategy. get business owners on board, stressing the competitive advantage they will gain, and encourage them to use the website to find products/services for their own use establish the clickfind brand in Australia and raise awareness of what it is. • What sort of marketing you are using to spread the word? Clickfind™ is in the process of reviewing its marketing strategy, bearing in mind the two main target audiences and both current and long term business priorities. So far all the marketing has been online: Google ads, email campaigns, blogs, press releases and the website itself. Following recent PR, interest in clickfind™ is growing, but direct approaches to businesses have yet to pay off in listing sales. 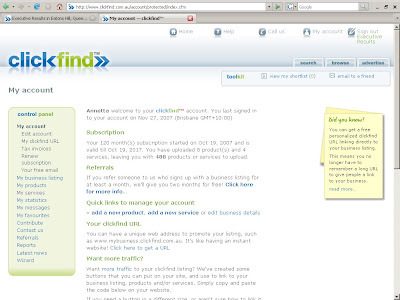 These are the some of staistics available at mid-March 2008, with no investment in online advertising. • How are you measuring the success of your venture? Are their any special mechanisms/tools are in place to monitor the progress? We are using Google Analytics to measure site stats and conversion rate. We also have created our in-house stats to measure success. One of the things main things we're keeping track of is the number of enquiries businesses receive, which is something we see increasing every week. In the end its all about businesses getting enquiries, enquiries turning into sales. Our customers will be happy and stay with us. In short, if business enquiries keep rising, we will be successful. • Which are the main competitors or major players in this market segment? • What are your thoughts on the future trends of your service and market segment you are in? With more and more businesses moving to online advertising, our market will only grow and we'll be offering more services like; affiliate marketing, permission marketing etc. • What are the main technologies used behind this start-up? ColdFusion allowed us to rapidly develop the application within 6 months. • What has been the most easy to use, out of box and helpful technology? ColdFusion has been the most helpful to us in regards to development of the site. Its a rapid application development tool with lots of extra features, like fancy flash graphs on the fly and PDF creation to mention just a few. • How much money is needed for the start-up? We are actively looking for investment to take the business to the next level. • What are the main barriers in general for people start their venture in Australia. I believe the main barrier is raising capital and getting media exposure. We've been trying to break through with paid wire services that distribute our Press Releases, but nothing major has been picked up or used. Thanks Taco for sharing your thoughts. We look forward to hear from you in future on the progress of Clickfind. All the best for Clickfind. Hello anonymous, it is a shame you did not leave your contact details, otherwise we could have discussed some of this. We very much appreciate feedback and suggestions. But I'm thinking there is a reason you did not leave your details, as I'm guessing you know your comments are based on nothing and you're a coward. Maybe if you did some research you would have noticed that we have 22,900 pages indexed in Google. If you have any improvements to suggest about the design, come forward and let us know. Looking forward hearing from you.